Tutored by Nature Inc: WHICH CREEK - WHICH SUBWATERSHED? WHICH CREEK - WHICH SUBWATERSHED? Hints: This Creek is on a subwatershed of the same name and is part of the larger Credit River Watershed. St.Julia elementary, David Leader MS, Meadowvale Village (K-5), and Mississauga S.S. are on this subwatershed and within walking distance of (?) Creek's riparian. What's its name? Post your answer and comment? Tutored by Nature Inc (tbyn@rogers.com) is owned and operated by Gary Mascola (BSc, MEd)- environmental educator and educational consultant. Tutored by Nature Inc develops local urban wilderness excursions that inspire and impel youth in 'Middle Childhood' and 'Adolescence' through Eco-stewardship and Eco-aesthetics. Knowledge base is experiential, age-appropriate, curriculum-linked. Participation ultimately anchors important local watershed ecological understanding. Tutored by Nature Inc offers to facilitate staff involvement in the Peel EcoSchool program. There is not a direct link at present but Peel District Board is the only current board of education that has hired a full time EcoSchools Program Leader. You can access information by visiting Peel's Intranet page located under the Board Services tab and/or ecoschools@peelsb.com . Tracy Appleton is PDSB's EcoSchools Program Leader and can help (905-890-1010 ext.2168). For more on EcoSchool Ontario check our links on this page. Hope to see you at EcoFest next spring. Amphibians: Frogs and toads (who are frogs as well) often are identified by their sounds. 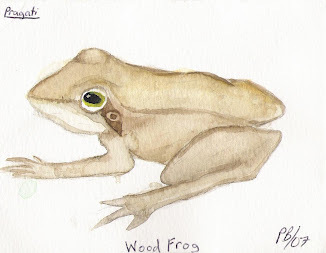 Spring Peepers, Wood Frogs and especially Western Chorus Frogs have been identified at the Creditview Wetland (heart of Mississauga) by Fallingbrook students over the past couple of years. The males are quite vocal in mid April through mid May. Many can be easily identified by sound and/or sight? Sounding a bit like a duck, the Wood Frog (above) sort of quacks. The Fallingbrook student who painted him (water-colour) captured his brown colour and dark mask nicely. Find out more about these very important life forms by using the very informative website below. FEBRUARY'S "SCHOOL THAT RULES ENVIRONMENTALLY!" Everyone - especially Tutored by Nature Inc and other Creditview Wetland Stewardship partners are proud and in awe of Fallingbrook Middle School teachers and students. This amazing school, in the heart of Mississauga ON, has been honoured on two occasions by the Friends of the Credit (2006, 2007), by the Province of Ontario (2008) and more recently by Tutored by Nature Inc (2009) for their sustainable ecostewardship of the Creditview Wetland. Along with their partners, Fallingbrook initiated, led and maintained their stewardship of The Creditview Wetland from 2004 to the present. Talk about sustainable stewardship! Fallingbrook M.S. is well connected 'naturally' - monitoring Wetland flora and fauna, planting shrubs to develop buffers, planting and playing an integral role in the development of the Wetland Interpretation Centre, educating and initiating the local community into claiming ownership of the Creditview Wetland Community Stewardship Committee, participating in ecology, language and art studies on the Wetland, etc. One grade 8 class went into the Wetland to clean out 'stuff' that had been dumped in the 'bog' over the past 15 or so years, e.g., 12 tires, several chairs, shopping carts and much more. Young environmentalists from Fallingbrook Middle School have participated in Peel EcoFair 2004, 2005, 2006, 2007, their student leaders attended PEYA’s EcoBuzz Conferences of 2006, 2007, and 2008. They have solidified a great partnership with the City of Mississauga's Parks and Forests, the Credit Valley Conservation, Tutored by Nature Inc and EcoAction (Federal Ministry of Environment). In the fall of 2008 and spring of 2009, teachers of Fallingbrook's grade 6 and grade 7 classes wanted their students to formalize their experiences and link them with their curriculum studies. So, they participated in Tutored by Nature Inc’s Eco-stewardship programmes. Part of their activities included monitoring the flora and fauna of the Wetland’s East Buffer, observing eco-relationships on the nine ecosites, capturing the small in nature with their camera and water-colour sketches, attempting to manage the Bindweed on the North and East Cultural Meadows, planting those very large trees and shrubs in part of the North Cultural Meadow, weeding and mulching previously planted shrubs, flowers and trees. To top it all off, the teachers and kids helped to leader and participate in the May 10, 2009 Community Wetland Celebration. Hope Mr.Zirnis's class enjoyed the Pizza Party for being the class that got most parents out at BogFest.